Enter the trigonometric, logarithmic or exponential function in parentheses. Then tap the exponent key (x^) twice to take the first derivative or three times to take the second derivative. To find the third derivative, take the first derivative of the second derivative. Enter each expression as given. 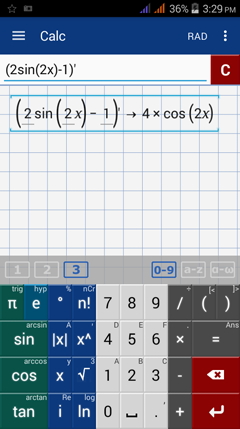 Type the expression in parentheses and take the first derivative by tapping the exponent key (x^n) twice. 3) Use a base 10 log by tapping the natural log key ln​ twice. 4) Use a base 10 log by tapping the natural log key ln​ twice.